The original Zebra Kid was the mountainous twenty-four stones George Bollas, an American born in Ohio in 1923. Bollas was wrestling by his early twenties, already wearing a mask and known as The Mystery Man. He wasa fearsome sight, a man of well over twenty stones wearing a striped mask. For a man of his girth he was remarkably agile and skilful, even having a hand in training British Olympic wrestler Dennis McNamara. Bollas came to Britain in November 1959 and immediately combated the best on offer. He made a huge impression on British fans, who were in awe of his immense size. 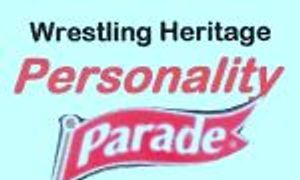 Unlike most masked men his record was never perfect, and our first recorded loss was against Mike Marino in May, 1960. On returning to the USA in the spring of 1961 there followed a long sequence of defeats against both distinguished, and not so distinguished, opponents. Bollas returned and set up home in Britain in 1963. By 1967 defeats, and unmaskings were coming fast and furious, and he retired in March 1968. George Bollas died in January, 1977, aged just 53. The name Zebra Kid personae was later adopted by Ireland’s Sean Regan around 1976, working for both Joint promotions and the independents. 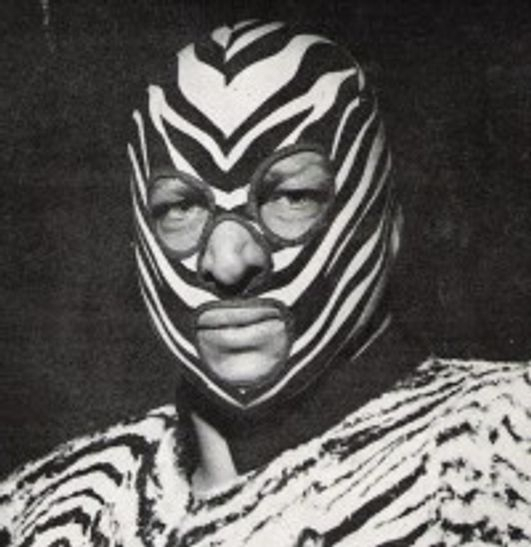 A third Zebra Kid, this time without a mask, was Roy Bevis, son of Ricky Knight. Dave Sutherland remembers the time he unmasked The Zebra Kid to uncover another mystery. The last bout of the evening had just got underway and since there would be precious little chance of anyone requiring nuts, ice cream or an orange drink at that time in the proceedings I decided to call it a night and take my tray and residual items back upstairs to the office where Audrey and Harry could check off the cash that I had returned against the stock that I had taken and work out my commission on the sales; or more likely to calculate how much I owed them! Hanging my white coat on the peg from which I had just taken my outdoor jacket I set out to go downstairs to the back of the hall where I could have a well earned cigarette and watch the last few rounds before returning to see how I had done sales wise. As I went through the office door onto the landing at the top of the stairs to the dressing rooms who should I find myself facing but The Zebra Kid who an hour or so earlier had less than endeared himself to the Newcastle crowd. He was still wearing his mask and chewing on the ever present cigar as I once saw it described; he was dressed in a pair of baggy trousers and one of those granddad vests which button at the top under a scruffy gabardine raincoat, a battered leather grip lay at his feet. Now in the pocket of my jacket was a brand new autograph book and The Zebra’s signature was yet to grace it so seizing the opportunity I handed him the book and pen and politely asked him for his autograph which he duly obliged and handed the book back to me. I thanked him equally politely and turned to make my way downstairs when he spoke for the first time; it was a curt and commanding “C’mere you” and placing a fatherly hand on my shoulder, giving me the full benefit of his 24 stones, he explained to me that he was expecting a taxi coming shortly and that there were kids downstairs in the foyer who might bother him for autographs or pictures upon his departure and since he was in a hurry this might not be a good idea as, he stated, “somebody might get hurt”. Therefore I was not to let anyone know that he was at the top of the stairs. I assured him that as an employee of the establishment he could count on my total discretion as I made my way downstairs, through the deserted foyer into the hall needing that cigarette more than ever at that point (I ought to point out that I haven’t smoked anything for over thirty years now). About half an hour later with the evening’s entertainment over and with commission in pocket my friend and co-worker Alan Patchett and I made our shortcut through the back streets of Newcastle to catch our train back to South Shields. The moment that we arrived at the entrance of Newcastle’s Central Station we were surrounded by the same kids who were the bête noire of Mr Bollas (a harmless but over enthusiastic group of adolescents who were more intent on collecting autographs than watching the wrestling) who were bursting to tell us that The Zebra Kid was in the station and not wearing his mask. Detaching ourselves from this young entourage I quickly explained to Patchett about my encounter with the Zebra on the stairs and I hoped that he didn’t think that I had told the kids where to find him. Within seconds he appeared from the direction of the platforms that serviced the North side of the Tyne and it looked like he was aiming for the barrier from where the Inter City trains could be caught which meant him passing me. Had he still been wearing his mask I doubt that he could have cut a less inconspicuous figure; his facial features could be best described as heavy and his hair was thinning, he was well on with another cigar as he hauled himself across the station near to where we were waiting. I don’t know how good a memory for faces he had and I wasn’t in any hurry to find out! Instead of going directly to the Inter City platforms he diverted into the W.H.Smith kiosk 100 yards or so away from barrier I supposed in order to avoid the unwanted attention that the kids might offer. Minutes later, the time being around 21:45 Smiths’ steel shutters came down, the lights went out, staff emerged and doors were locked but no Zebra Kid? Now anyone who ever saw him wrestle would confirm that for such a large man he was possessed of a lightening turn of speed which he often employed to bring down an opponent but I doubted that he could replicate that over 100 yards on Newcastle Station without being noticed. The most plausible explanation that I could come up with was that he had somehow persuaded the staff of W.H.Smith to let him onto the platform via a back door thus escaping his predators. However it was my experience that to work for that establishment you had to have a most curmudgeonly attitude and doing favours wasn’t part of your job description. So from that day to this I am still intrigued as to where he disappeared; I can always say that on that December Saturday night in 1964 I witnessed the Zebra Kid unmasked, although not in combat, yet he left me with a bigger mystery to solve.